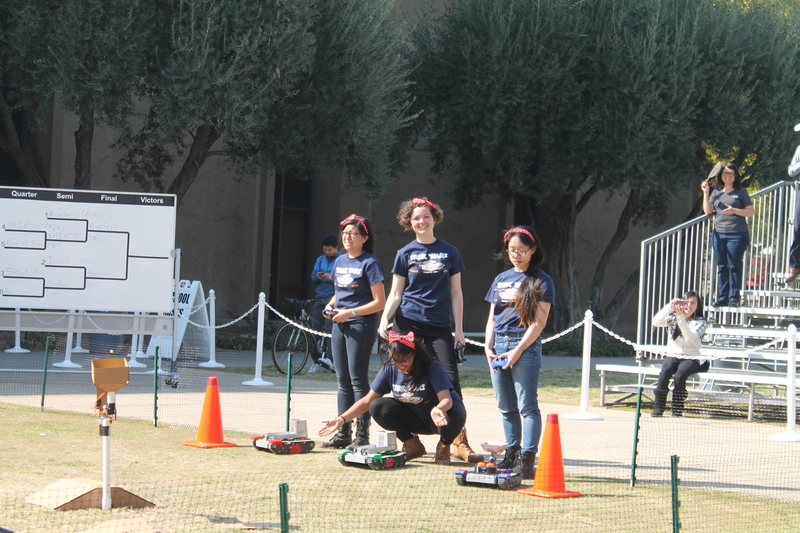 Today was the ME72 robot contest at Caltech. I’ve been going to see these things for over 20 years, and it’s always entertaining. 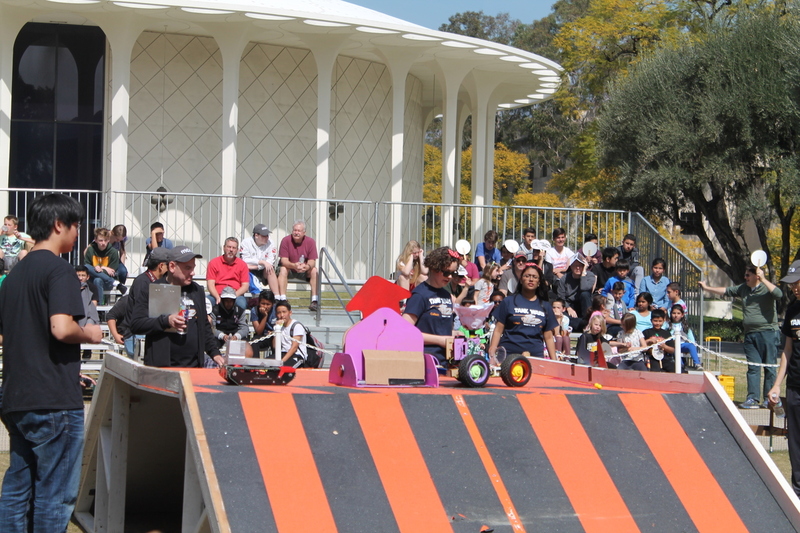 The theme this year was “Tank Wars”. 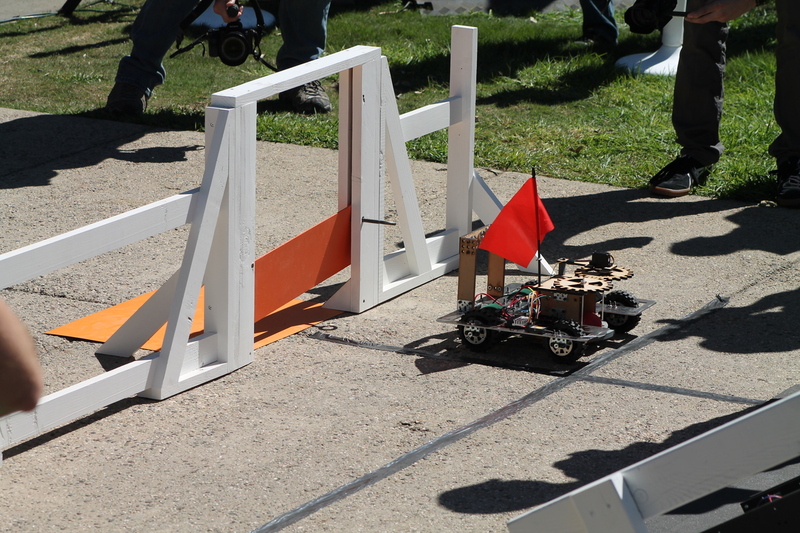 Each team had to build three tanks, and the tanks had to fight for control of three bases on the playing field. 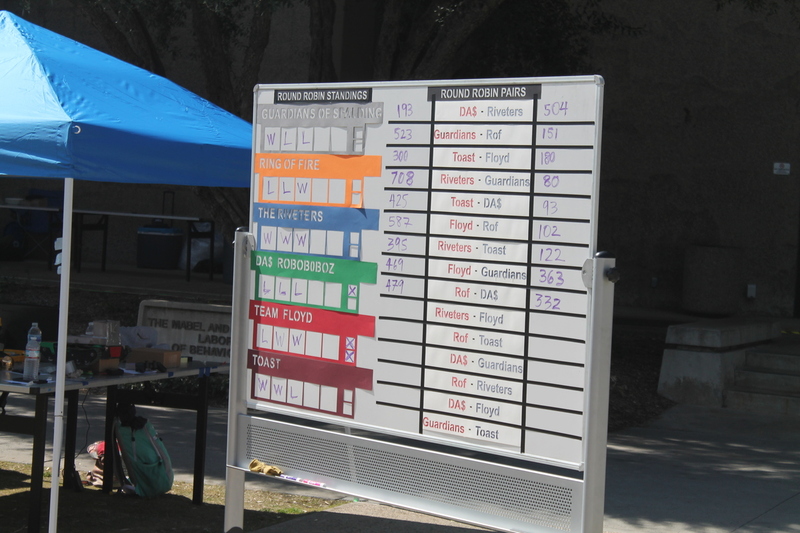 Each base had two buttons on it, and to take control of a base, one team’s machine had to push the button corresponding to the color of that team. One base was on the ground in the middle of the playing field. 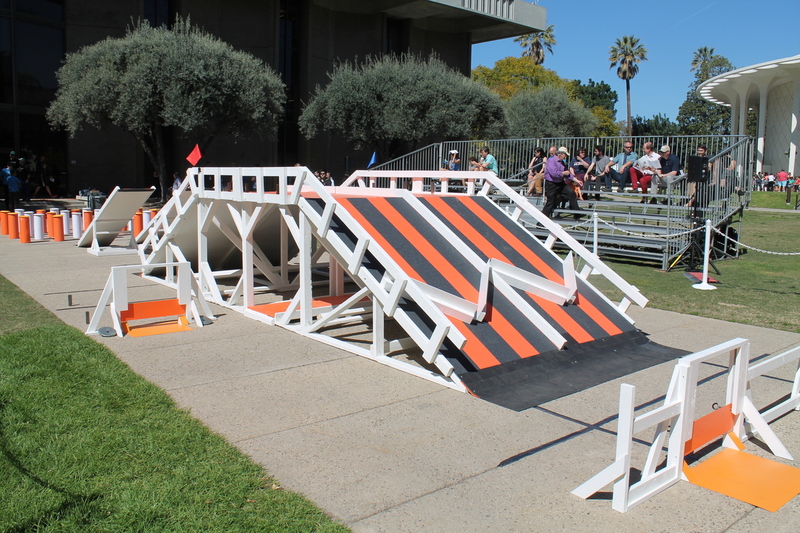 One of on a see-saw, and the third one was on top of a platform with ramps leading up to it from both sides. The ground base was worth one point for each second of control. 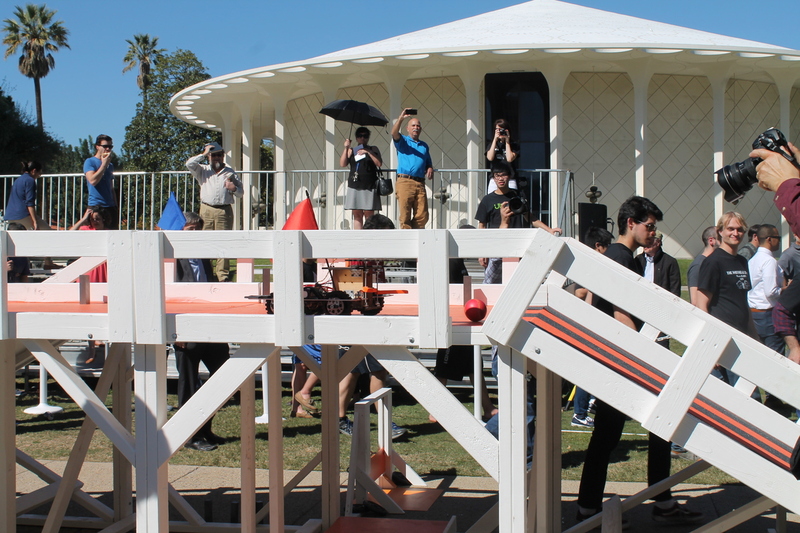 The see-saw was worth 1.375, and the platform base was worth 1.75 points per second. 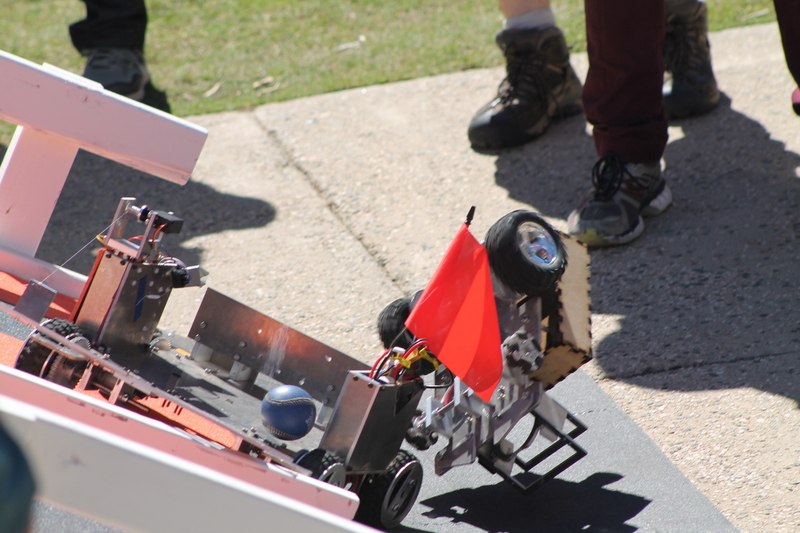 As a result, most of the time, machines from both teams would go up to the platform, and a lot of times they ended up just alternating control of it for the duration of the match. So the point advantage of the platform wasn’t that much of a factor in most matches. 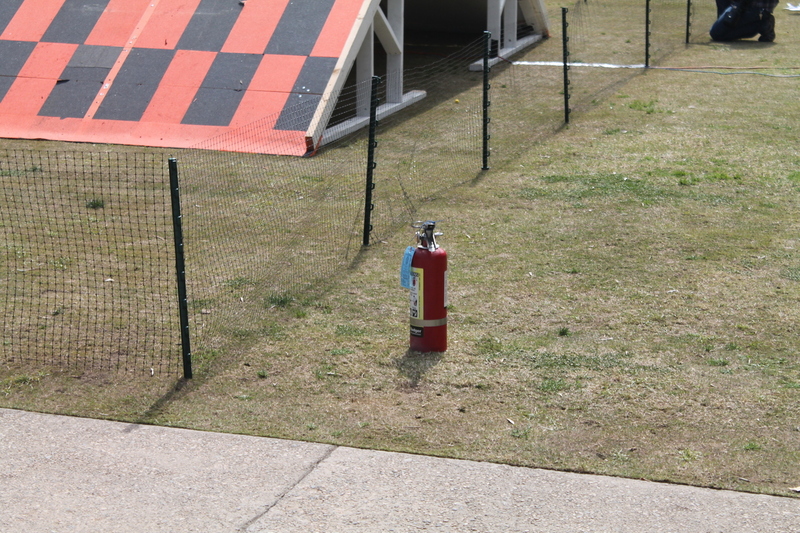 One funny thing was that they had a fire extinguisher handy by the playing field. 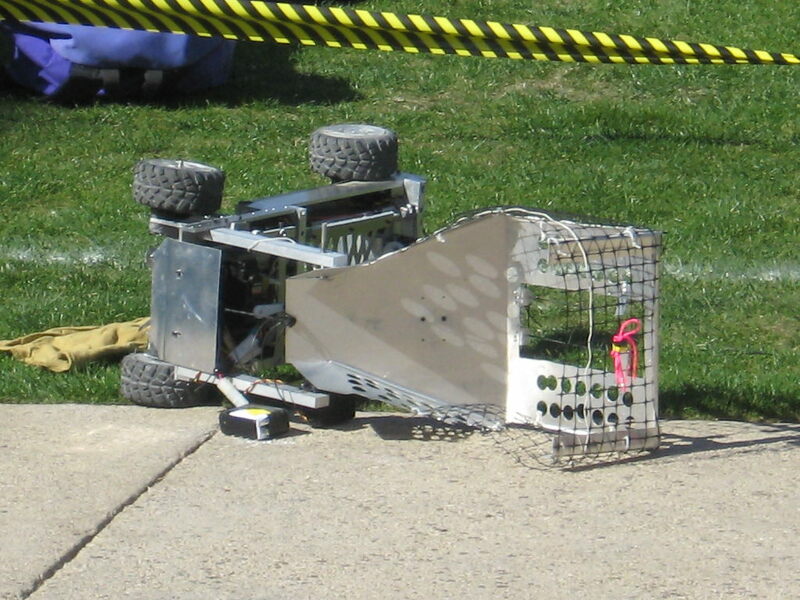 This was because of the incident two years ago when one of the machines caught fire in the middle of a match. 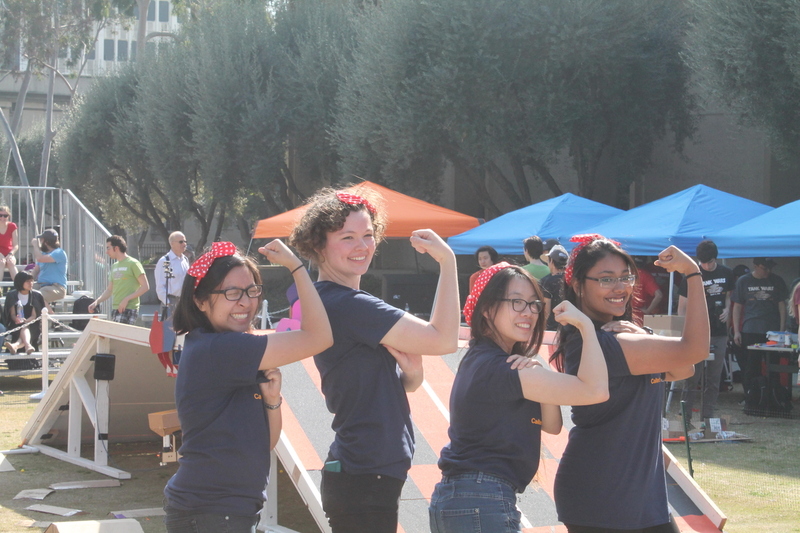 The first match was won by the Riveters team. They had a clever strategy. 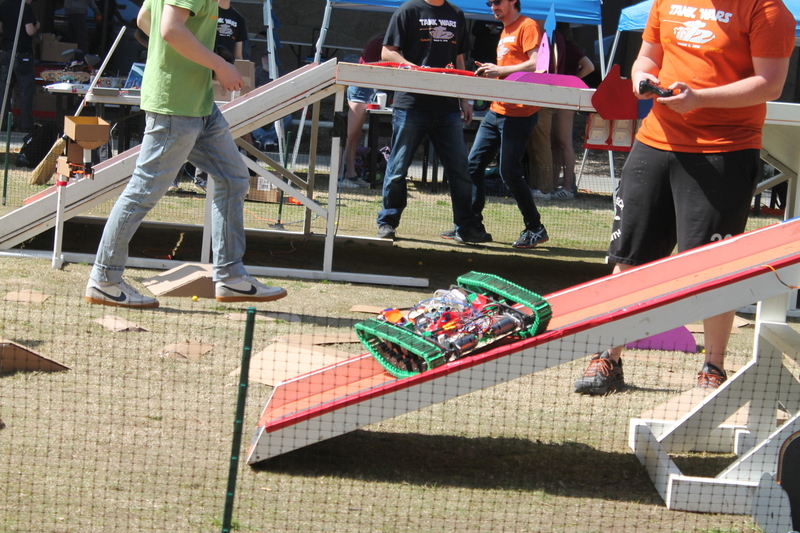 In each match, they had one machine go and take control of the see-saw base. Then the machine would drive to the center of the see-saw and balance there, so no other team’s machine could even get on the see-saw. This worked well for them, and in the end, the Riveters were the only undefeated team of the day. And that included the final. Very well-done. They deserve both ears and the tail. 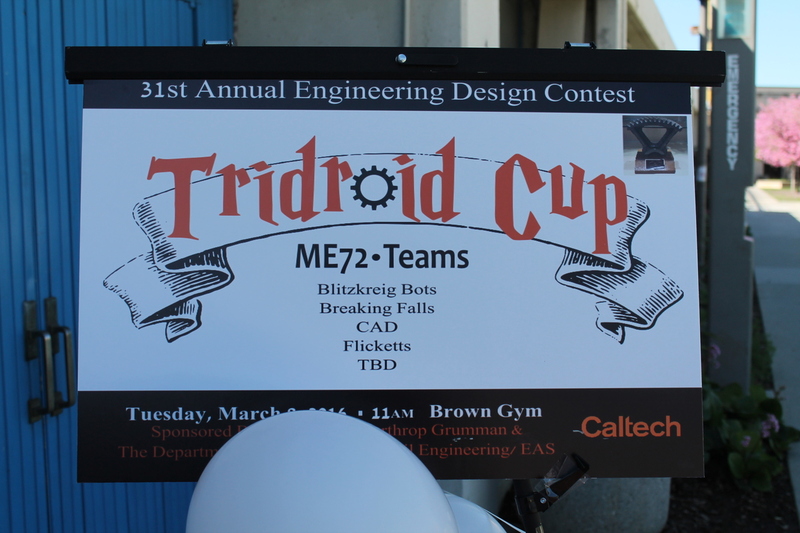 Today was the annual ME72 Engineering Contest at Caltech. I try and go see it whenever I can. It’s generally very entertaining. 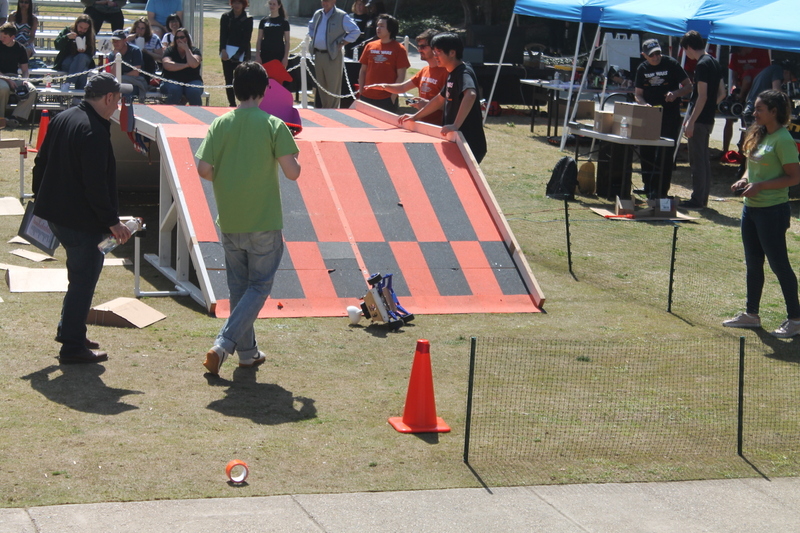 The basic premise is that teams of students have to build a machine or machines to engage in a contest. 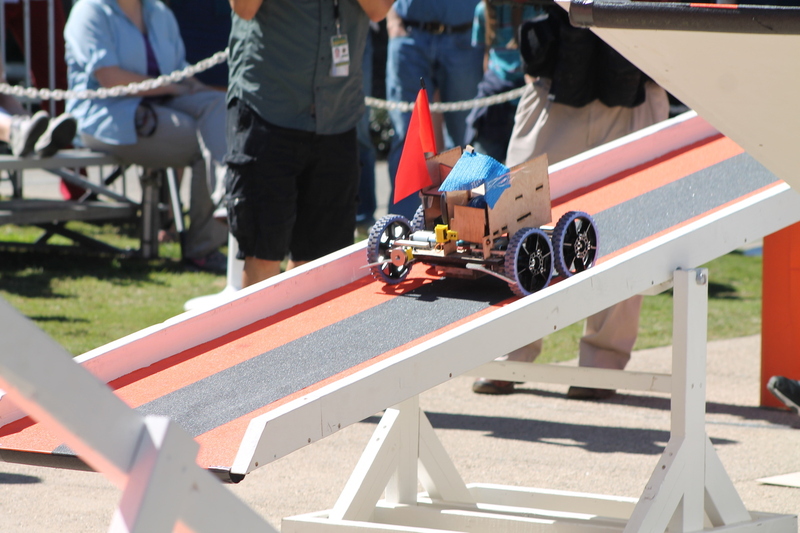 With advances in technology, the contests have become more elaborate. 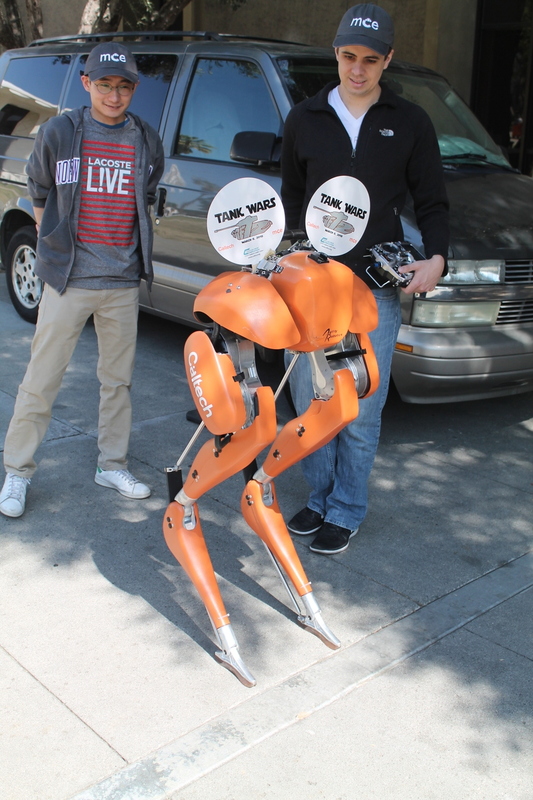 And in recent years, they’ve even added a requirement that the machines operate autonomously for the first 40 seconds of each contest. 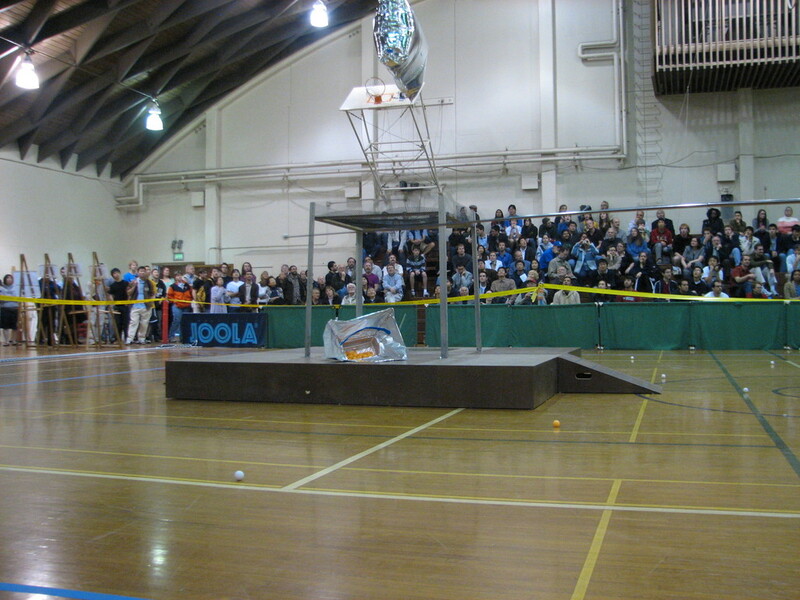 This year’s contest was to build three machines to navigate an obstacle course and deliver a baseball into a hole at the far end of the course. The first machine had to drive through a field of concrete-filled pylons, and then transfer the ball to the second machine. 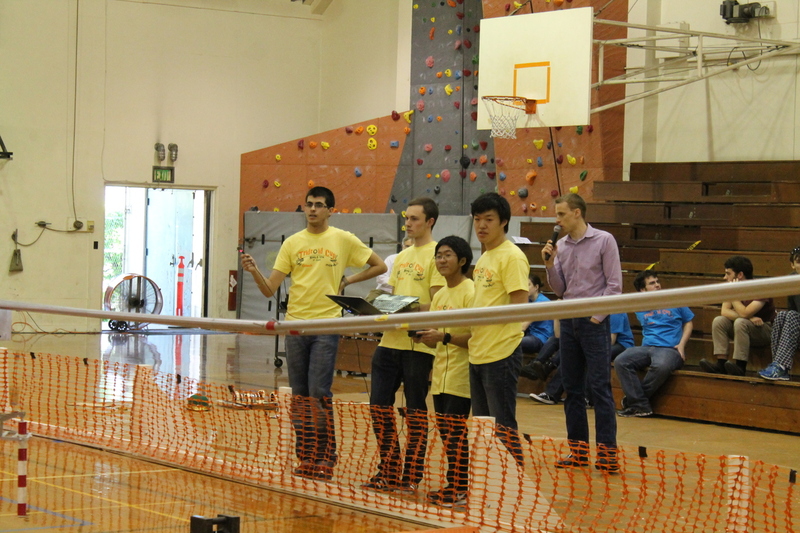 The teams got extra points if their machine could make its way through the pylons autonomously. 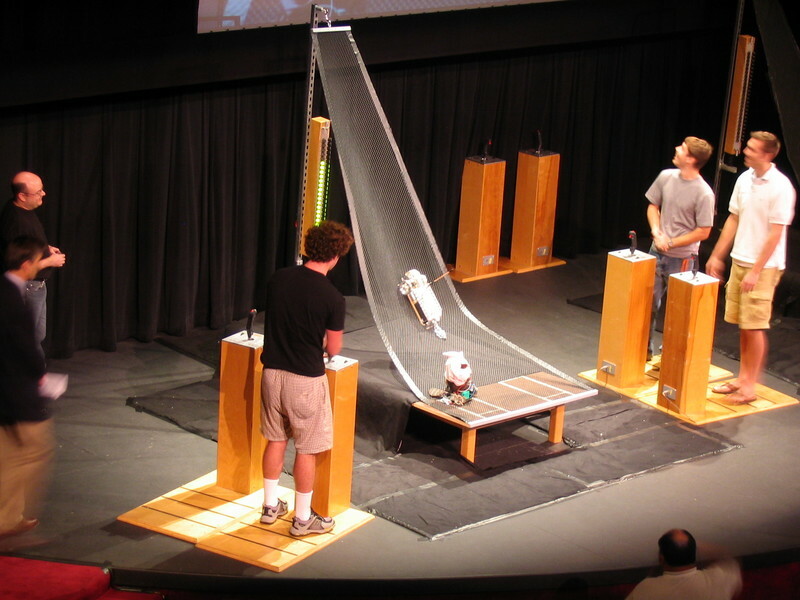 The second machine had to drive up and over a teeter-totter, and then up a 30-degree slope, across the flat top of the platform, and then transfer the ball to the third machine that was waiting on the other side. The third machine then had to open a small gate and carry the ball to the goal. 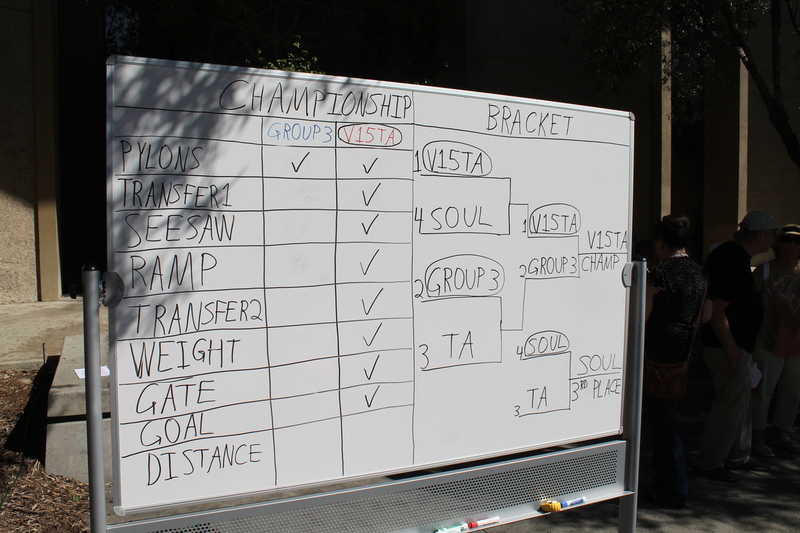 It turned out that this set of tasks was quite difficult, and in the first round, only the V15TA team was able to get all the way to the goal. In the end they made it to the goal in several matches, and only Team Soul was able to make it all the way even once. Based on that, we all figured it was going to be V15TA in the end, and that’s what happened. 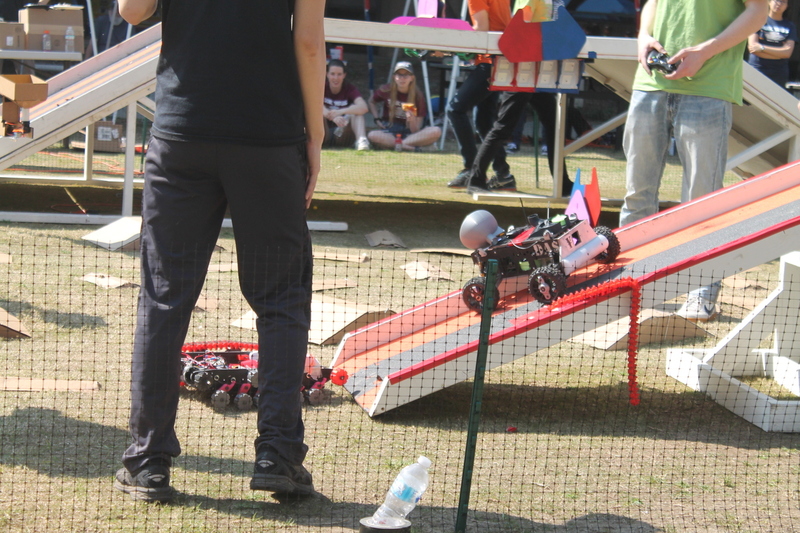 In the final match, their machines performed a flawless run from start to finish. It was pretty impressive. 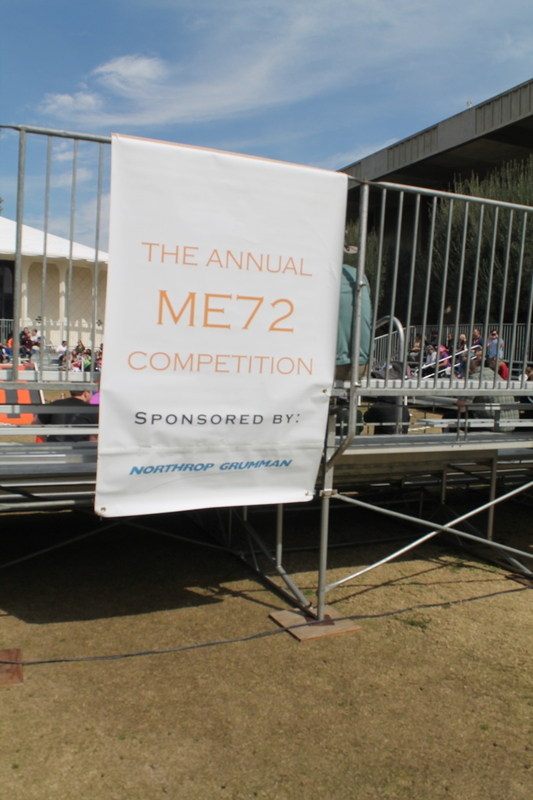 Today was the ME72 contest at Caltech. 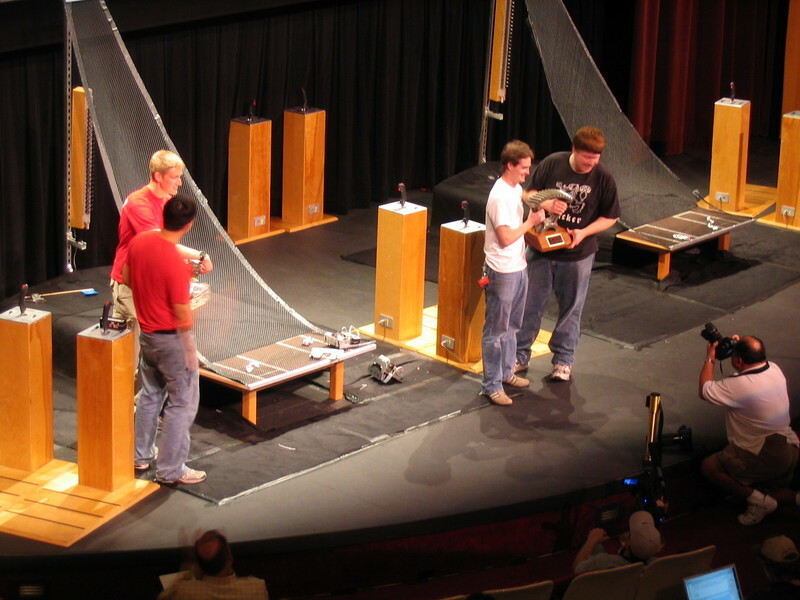 This is the engineering class where the students get a box of junk and have to use it to make one or more machines to compete in a contest. I’ve been going to see this for as long as long as I’ve been at the USGS office at Caltech, and it’s always great fun. 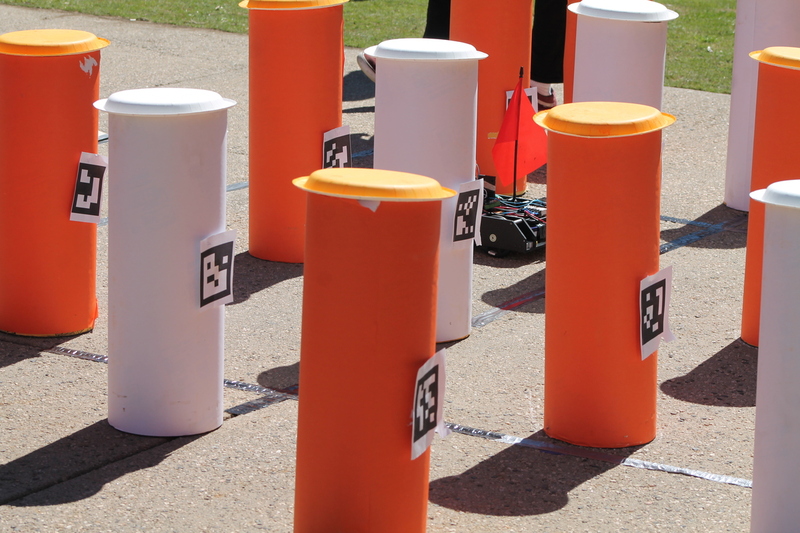 This year’s contest was the Tridroid Cup, where each team was supposed to build three robots to compete as a team to score points by putting small soccer balls through goals at the far end of the playing field. The two floor-level goals were worth one point, and the single raised goal was worth three points. 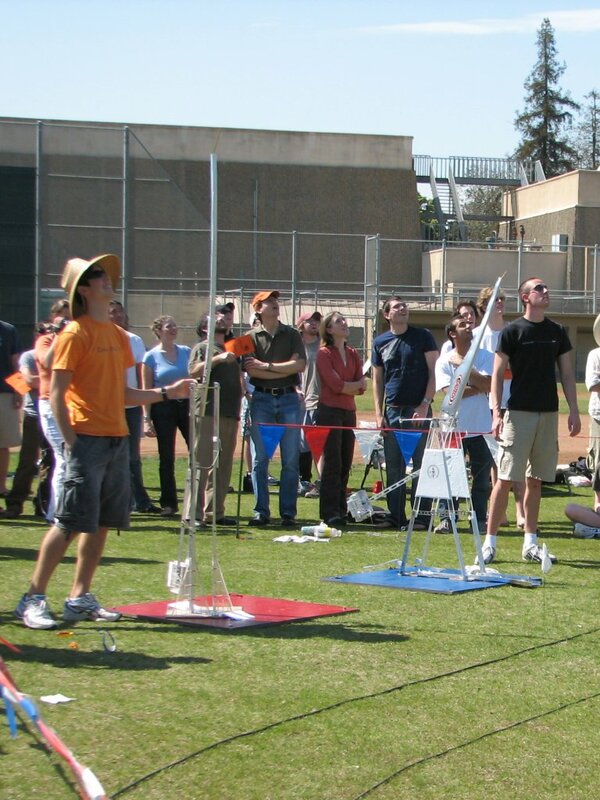 All the teams get the same junk to start with, but they all come up with different approaches to the problem. Most of them had machines with sort of a scoop on the front to be able to push the balls through the floor-level goals. 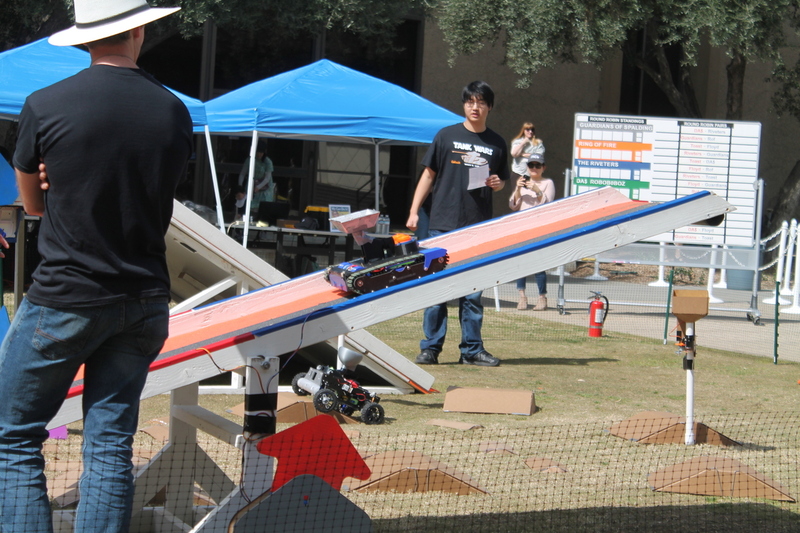 The Caltech Armored Division team’s machines were very fast and manouverable, and they were able to score lots of points by just pushing lots of balls through the goals. But then one of them got stuck trying to drive over the divider down the middle of the field, which was a limitation of their low-to-the floor design. 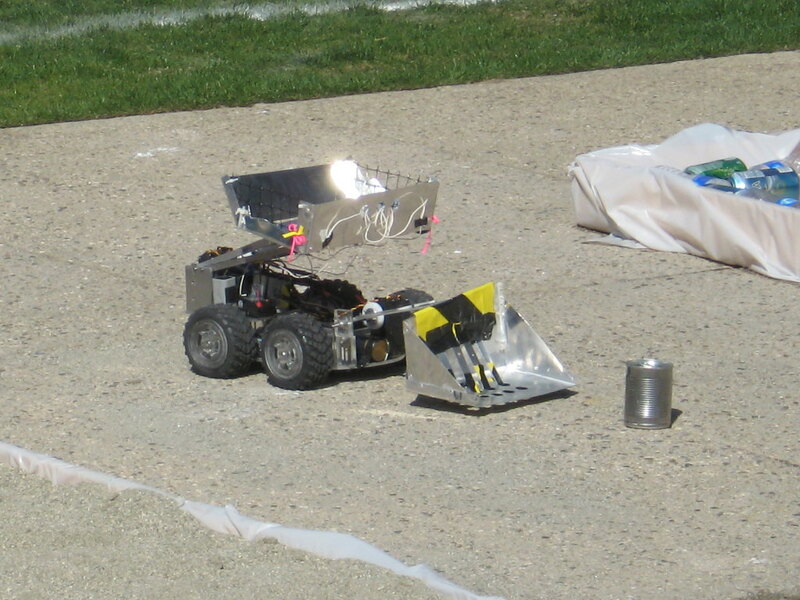 Today’s contest was special in that it was the first time in 20 years of coming to see these things that I saw one of the machines catch fire during a match. Their machine was just driving across the floor when a small circuit board on it just suddenly caught fire. They smothered the fire with a wadded-up T-shirt, and the match continued. In the end, it came down to the Blitzkrieg Bots against TBD. 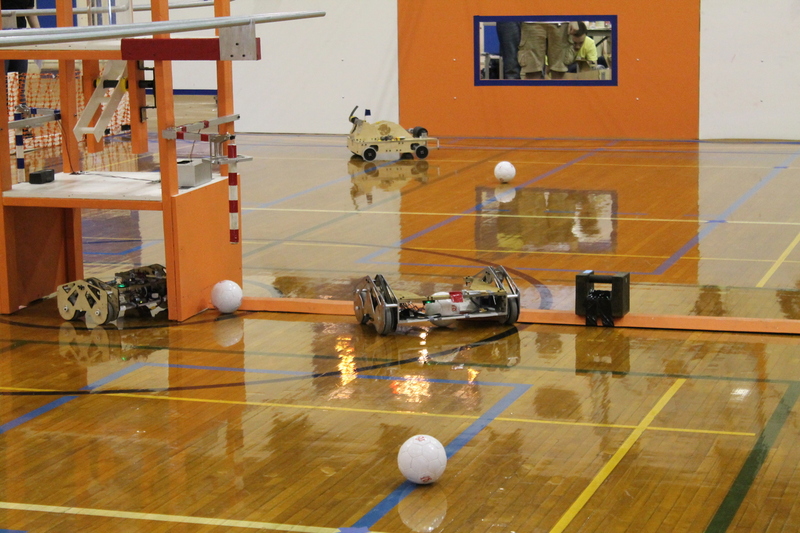 The TBD team had machines that could pick up several balls at a time and fling them through the high goal. At three points for each ball, they won lots of matches by just parking their machine in front of the goal and shooting balls through it. But the Bots had a low-slung ball-pusher machine, and a tall machine that they used to block the balls being flung at the high goal, and in the end, that divided strategy worked, and they were the winners. And the whole thing was very entertaining to watch. It’s Thursday evening, and time to torture myself on the stairs some more. Tonight I wanted to try a new experiment for handling the middle section of stairs from 24 to 44. Because the floors are 22 steps each, doing double steps leads to an unbalanced pattern, where one leg is doing six doubles and the other is only doing five. In the past, I’ve tried both switching off which leg starts each floor, and also doing one single step at the beginning and the end of each floor. With the single-step strategy, I was able to do a pivot turn without an extra step on the landing, but because the landing is wide, I still ended up losing a fraction of a second on each landing due to the stretch. And doing doubles and switching which leg leads makes a balanced pattern at the cost of adding one extra step per floor. So tonight I wanted to try going with the unbalanced pattern and just adding the extra step to switch sides once every five floors. On the other two sections of stairs I’ve been switching off which leg does the extra work every five floors, and that’s worked well. So I figured doing this on the middle section would be balanced enough and still eliminate unnecessary steps. 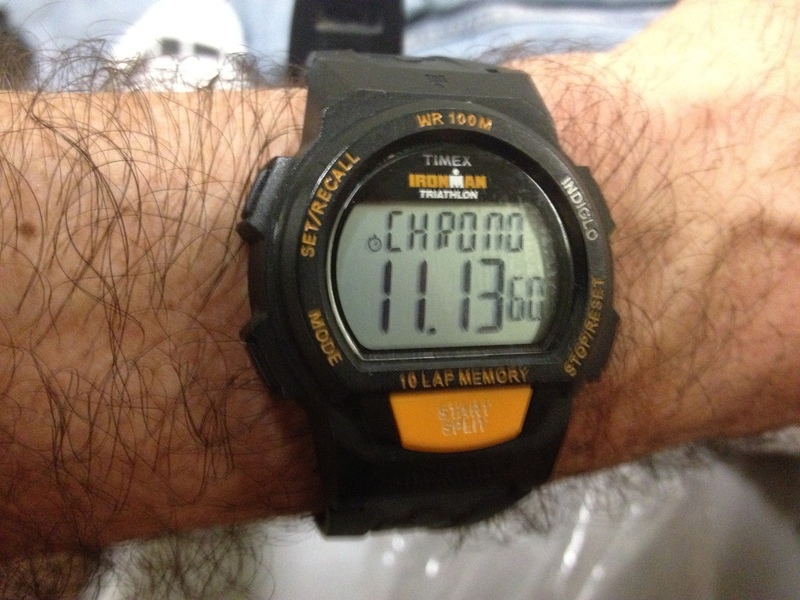 I was on schedule all the way to 22, and I had a look at my watch at 24. But at that point I kind of lost track. I was keeping track of five floors at a time to decide when to switch which leg led off, and at the same time I was trying to keep track of six floor chunks to see if I was doing them in one minute according to plan. And it got to be too much. So I just gave up on the timekeeping and concentrated on trying to maintain my pace. And it worked well. 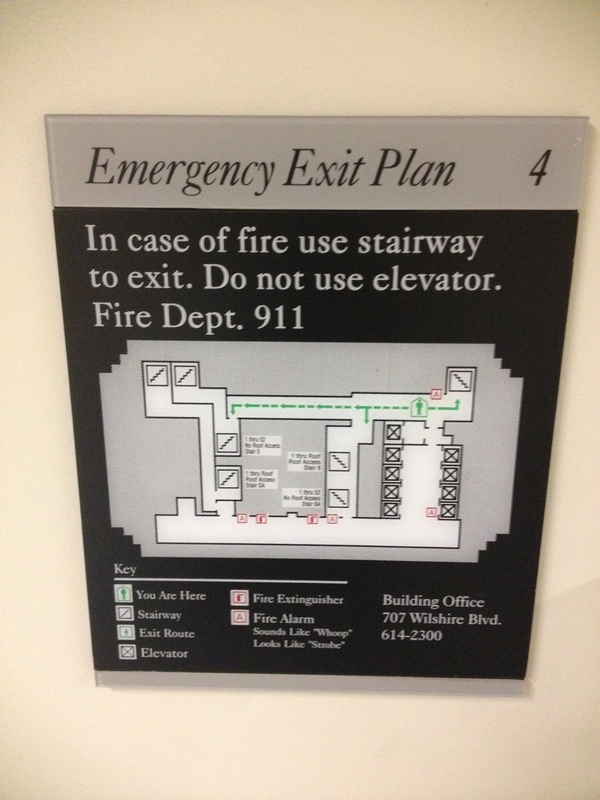 I think the ’switch legs every five floors’ strategy is a winner. 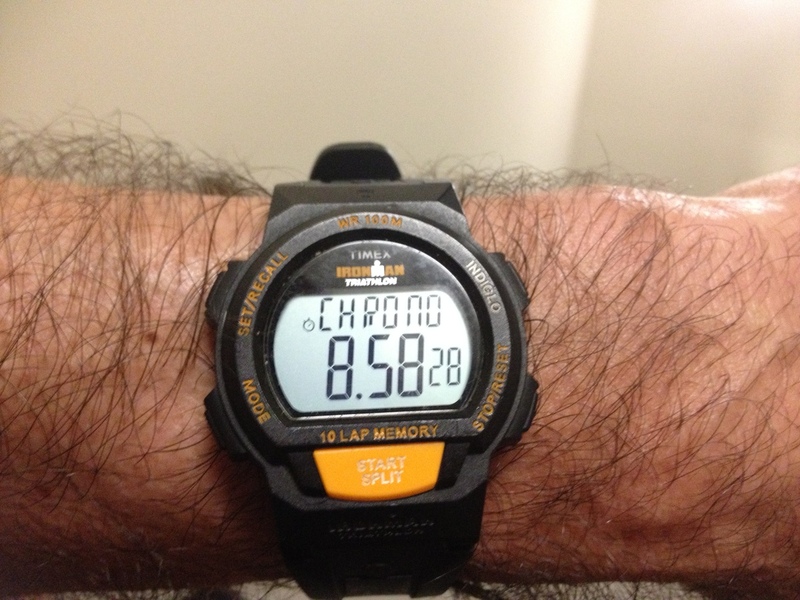 At 44, I took a quick look at my watch with the aim of seeing if I made it to 50 in one minute. And when I got to 50, I’d made the one minute target, and it was just a few seconds after eight minutes in. At that point, I knew I had a shot at beating my best time of 8:58. So I ramped up the pace for the last five floors. 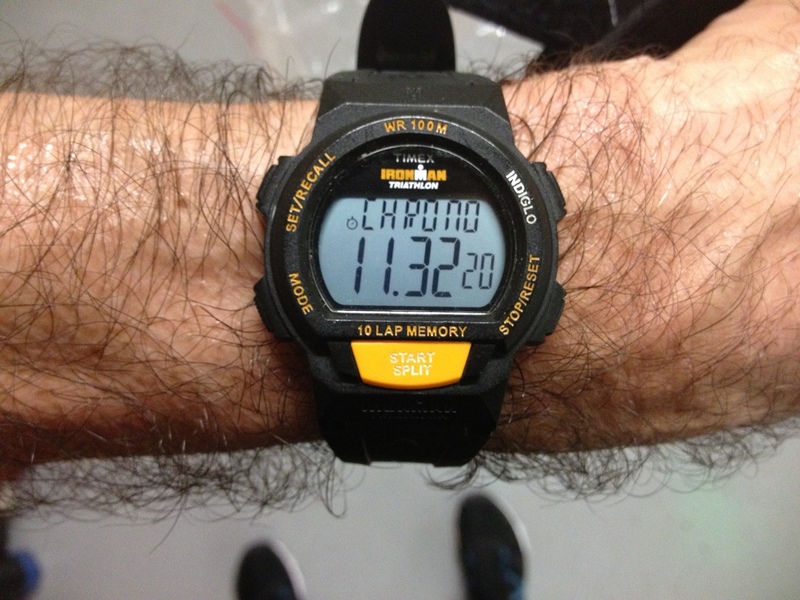 And when I heaved up onto the landing at 55, I had 8:58. Again. Still, I can’t complain. Last year, when we were climbing up to 60, I did 9:48, but I was only able to do that once. Oddly enough, that was on Valentine’s Day, too. That I’ve managed to do 8:58 twice is a good thing. Maybe next time I can beat it. After a few minutes of rest, I headed back down to start up again. The second time up, my goal was just to follow the step pattern and try to go up non-stop. When I got to about 39, I could hear someone coming up behind me. I looked over the side and saw that it was Veronica, and as usual, she was moving fast. So I put on a little burst of speed just so I could make it to 44 ahead of her. 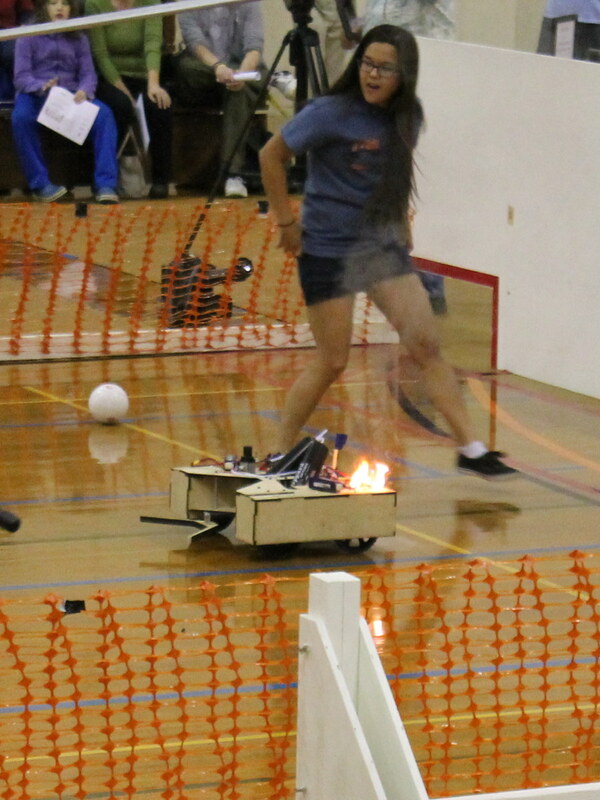 Then I was able to hold open the two fire doors for her so she could go faster. 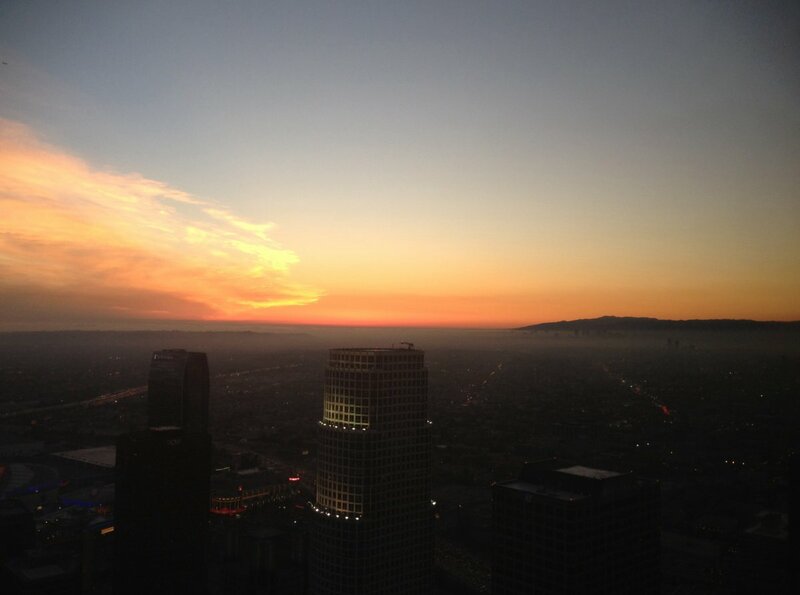 Then I just sort of cruised up the last 11 floors to the top, and I was pleasantly surprised that I had made it up in 11:32. That’s not bad for a second time, especially when I’d gone fast the first time. I went back to the bottom and hung around there talking for a while. I wasn’t sure I wanted to got up again. I was sort of hoping Amber and her entourage would show up and I could walk up with them. But they weren’t there tonight. So I finally just decided to do it.. Again, I was just sort of cruising. I was hoping to do about 12-12.5 seconds per floor, and I managed to get close to that. And when I got near the top, I could hear someone ahead of me. Leland had started up a little ahead of me, and I was catching up to him. So that gave me a little boost, and I picked up the pace for the last 10 floors to see if I could catch him. I didn’t catch up before the top, but I came close. And I did 11:14, which is really remarkable. I don’t think I’ve ever done a third climb that was faster than the second. So all in all, it was a good evening in the stairwell. 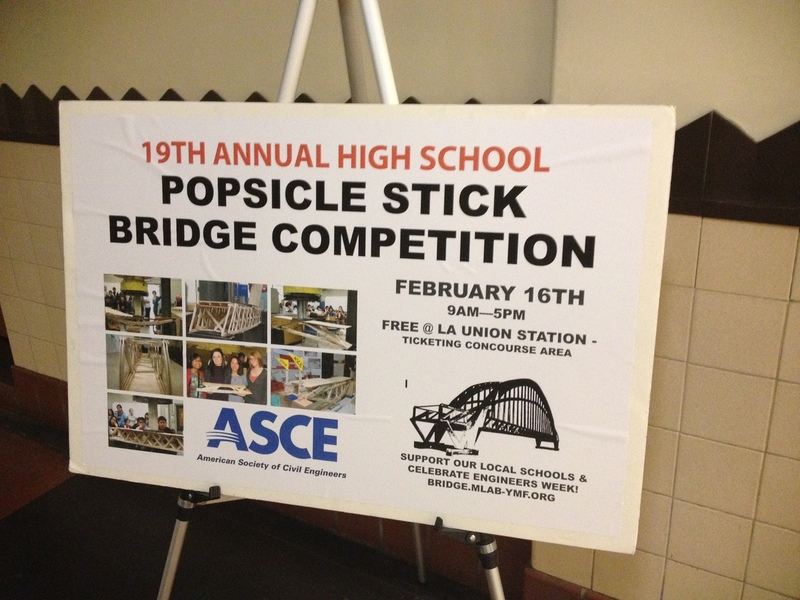 And on the way home, I saw a sign that they are having the popsicle stick bridge competition at Union Station on Saturday. I think I may have to ride down there to see it. 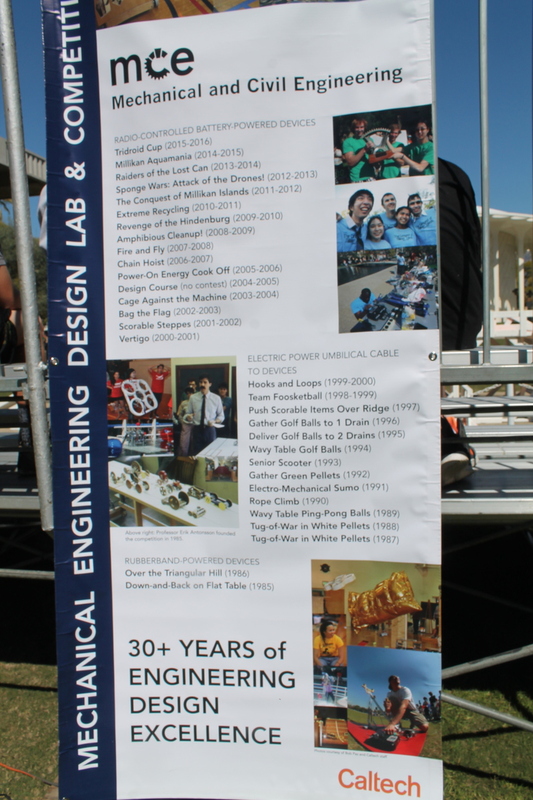 I like seeing engineering contests. It’s springtime at Caltech. 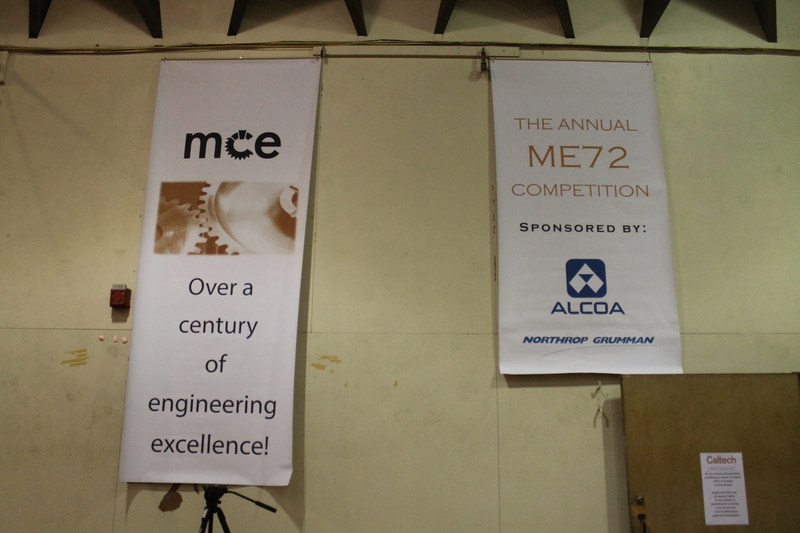 Which means it’s time for the ME72 engineering contest. I enjoy watching this whenever I can, since it’s always good geeky entertainment. 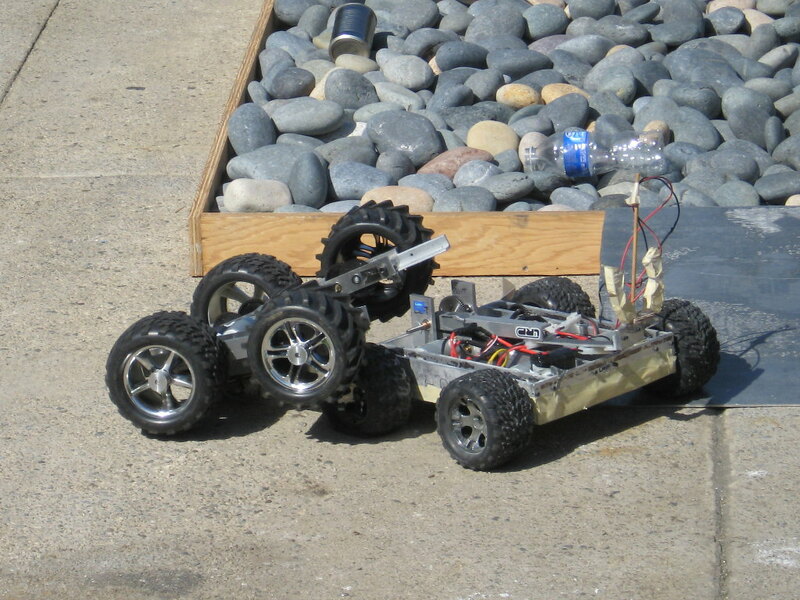 This year’s contest was to build machines to collect bottles and cans for recycling. 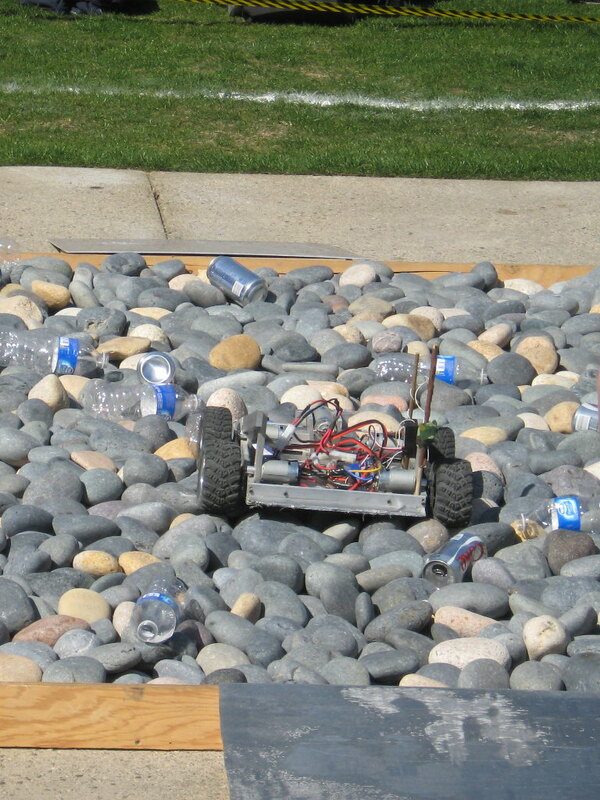 The bottles and cans were spread around on the concrete, and they also had some on a set of ‘terrains’ for the machines to drive on. 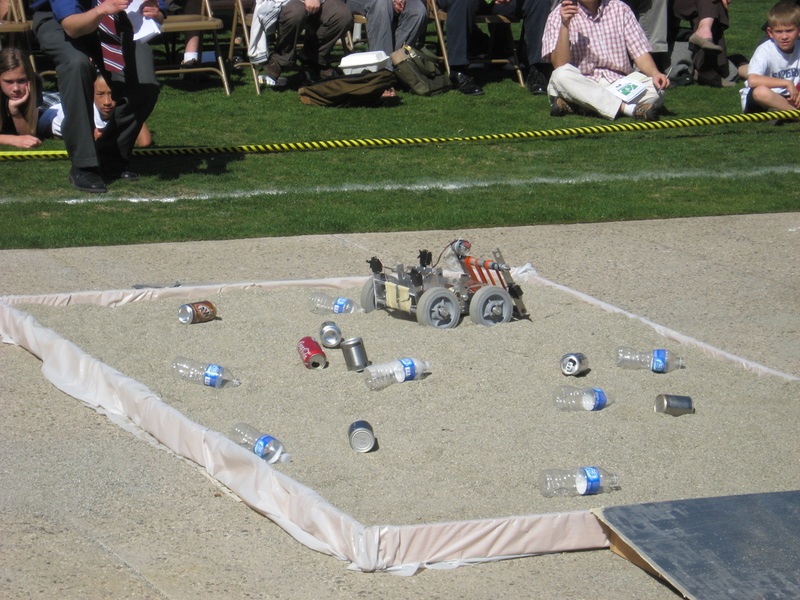 The terrains included a shipping pallet, some rocks, sand, and water. 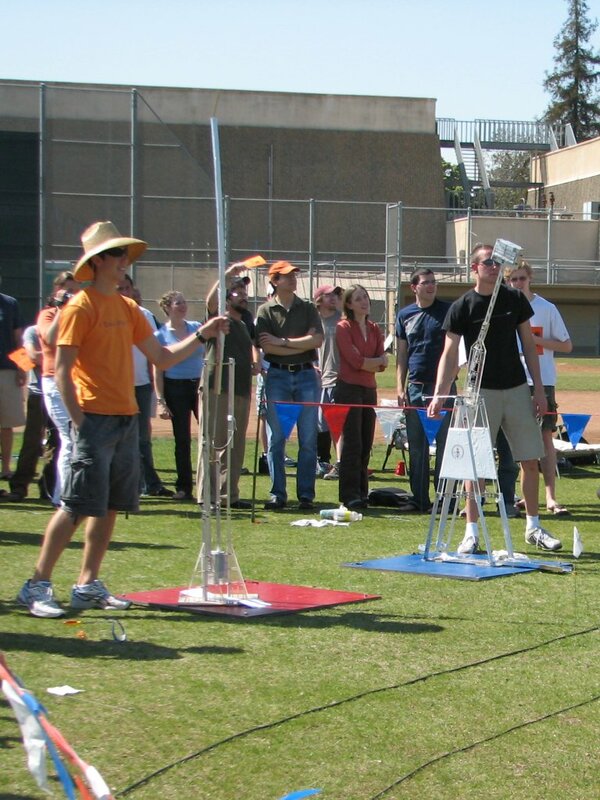 At the far end of the playing field, each team had three boxes for each of plastic, steel, and aluminum. 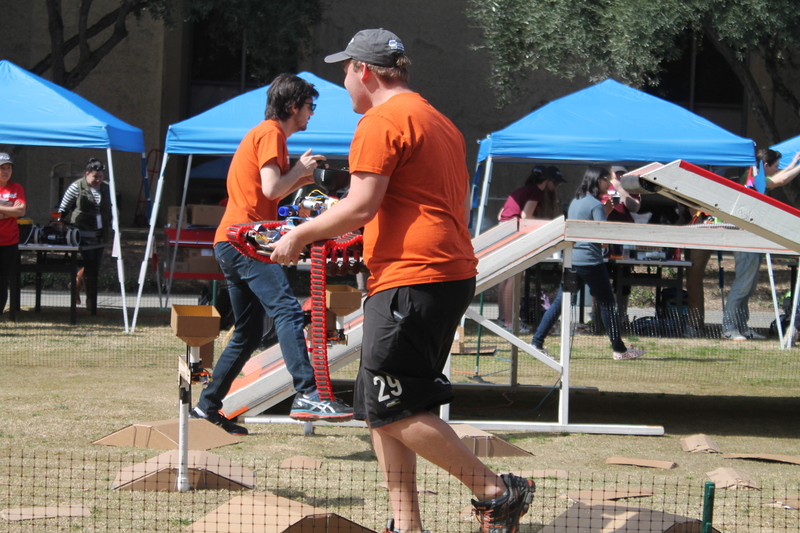 They got points for getting the containers down to the boxes, more points for getting them in the boxes, and still more if they could do all that and get their machines back to the starting line before the end of each 5-minute match. 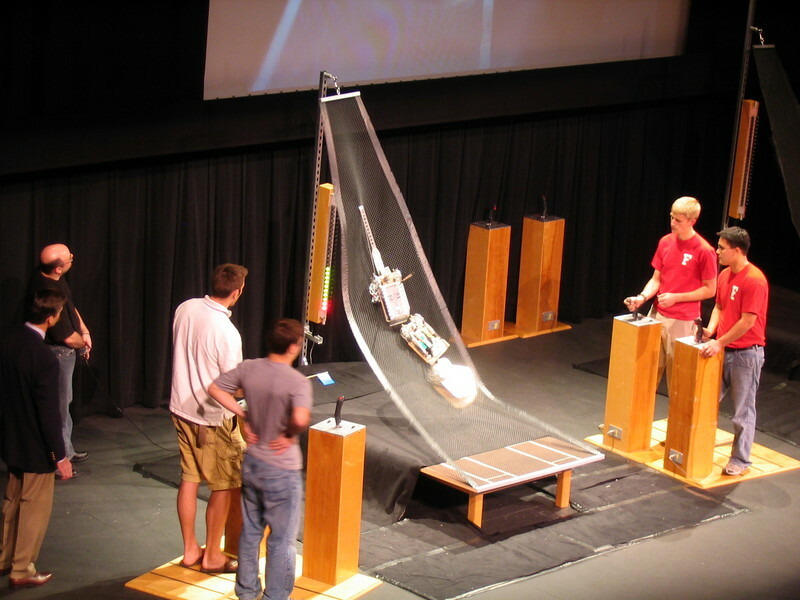 Each team built two machines for the task, and as always, some of the machines were designed solely to interfere with the operation of the other team’s machines. 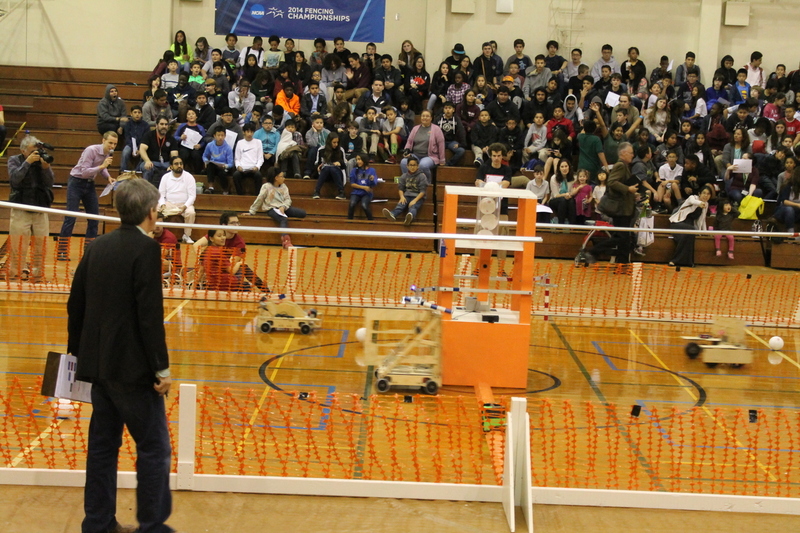 So we got to see some good machine clashes, which is always a hoot. In the end, Team BRB won with a good basic strategy. They had one machine that quickly scored at the start of the round, and then it and the other machine would attack and pin down the other team’s machines so that they couldn’t score. And that strategy brought them the trophy in the end. 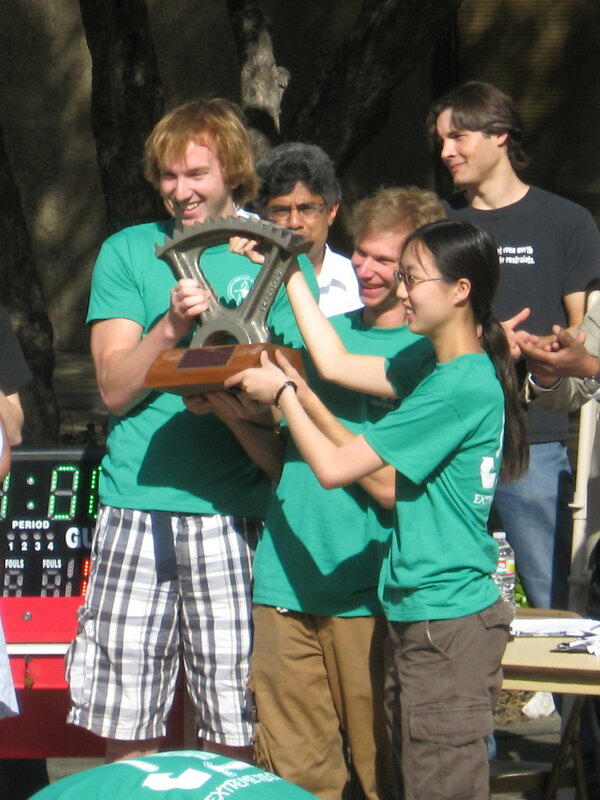 And that’s when a young man’s fancy turns to the ME72 Engineering Contest at Caltech. I’ve gone to see this several times over the years, and it’s always great fun. 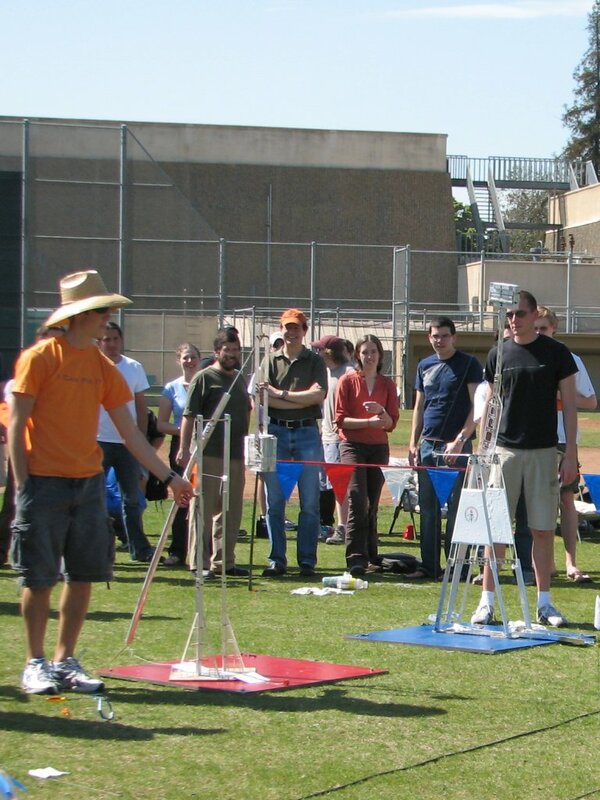 The 2008 contest featured machines hurling a ball across a field. 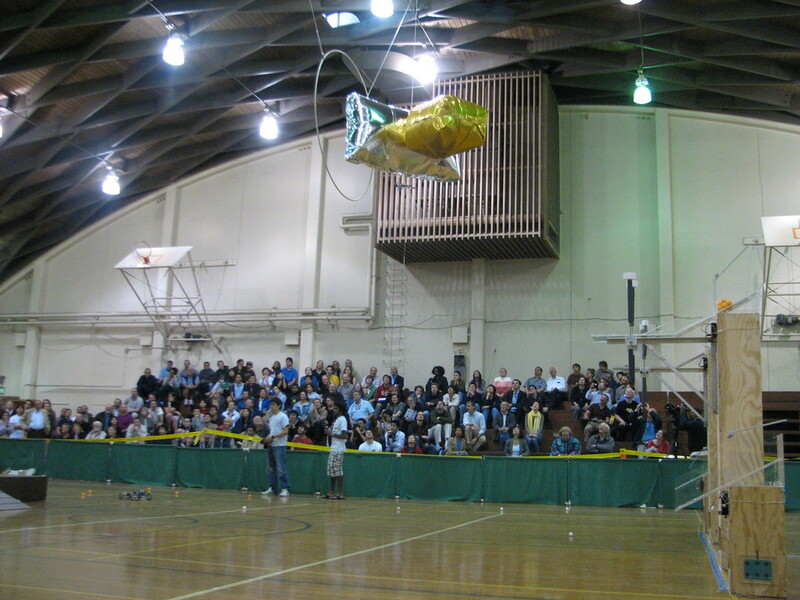 In 2007 they had to place a small piece of chain high up on a net. And the rules explicitly allow machines to interfere with their opponents’ machines, which makes the whole thing much more entertaining to watch. So next Tuesday, I’m going to walk over to the gym and see this. It should be fun. 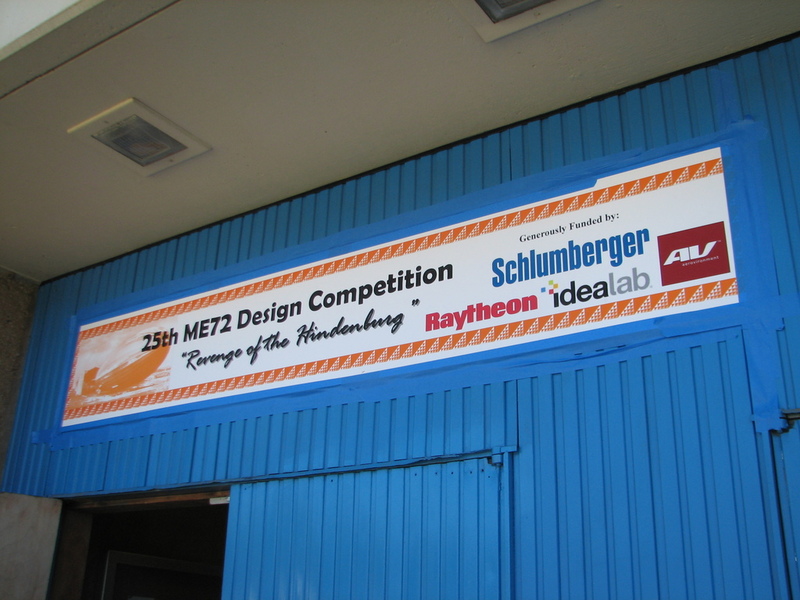 It’s springtime, and time for the ME72 Engineering Contest. This year’s contest was a departure from the past ones I’ve been to. 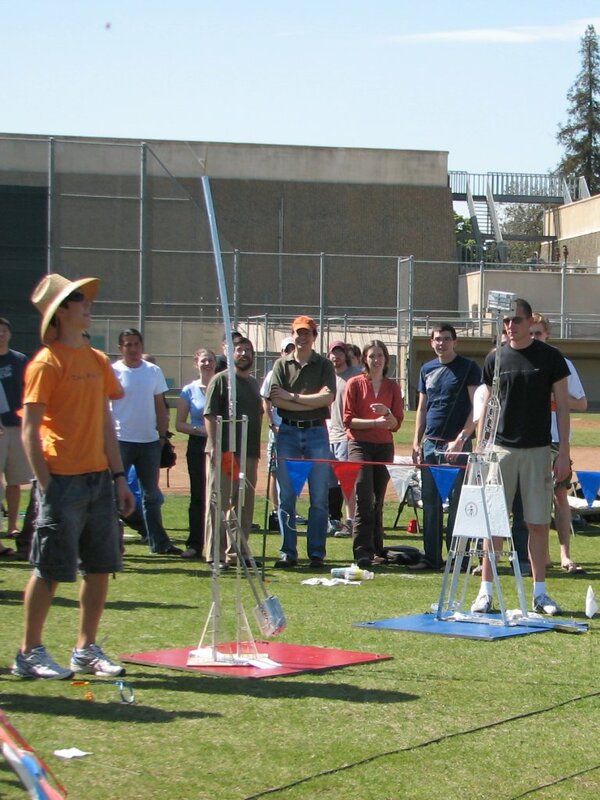 For the first time I remember, it was held outside, and this time, the contest was to build a machine to launch a small object across the field. They had a horizontal rope 30m from the launch pads, and 5m high. 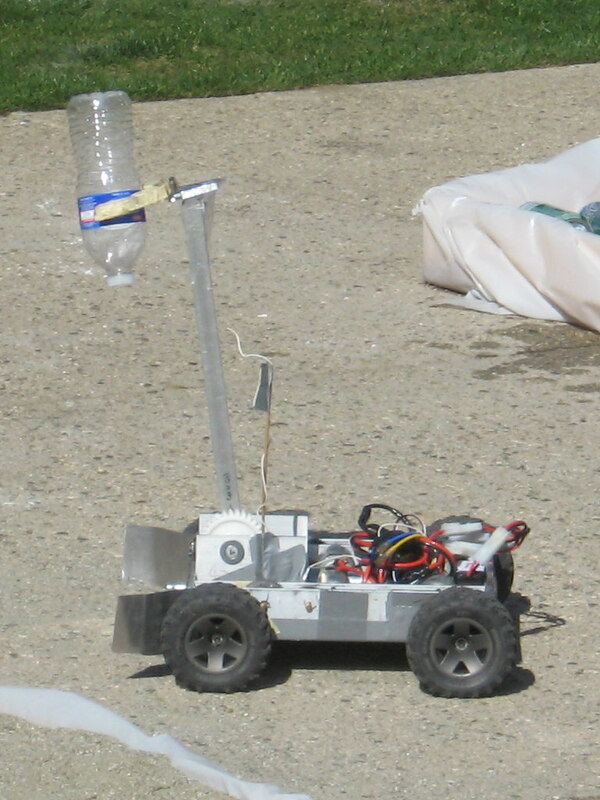 The machines had to send their payload over the rope. Beyond that, the longest distance would win. The machines ran two at a time against each other. 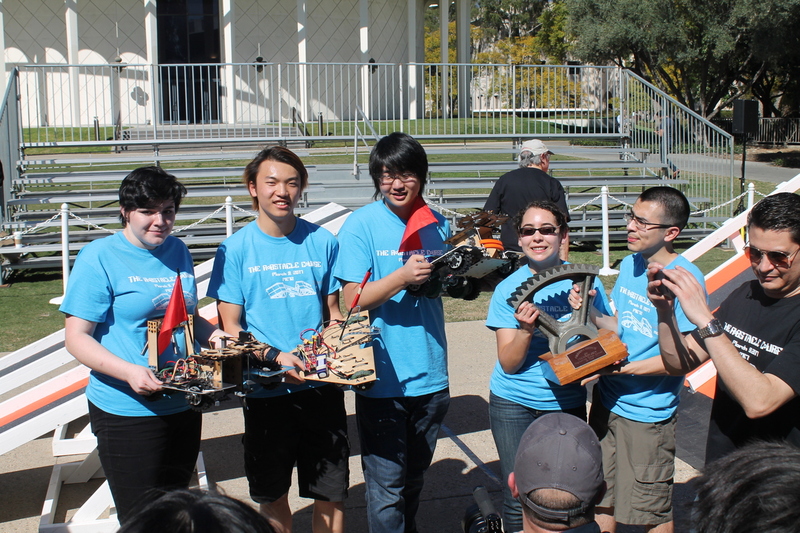 So the winner each time was the machine that threw its payload the farthest in that round. There were basically two types of machines used. 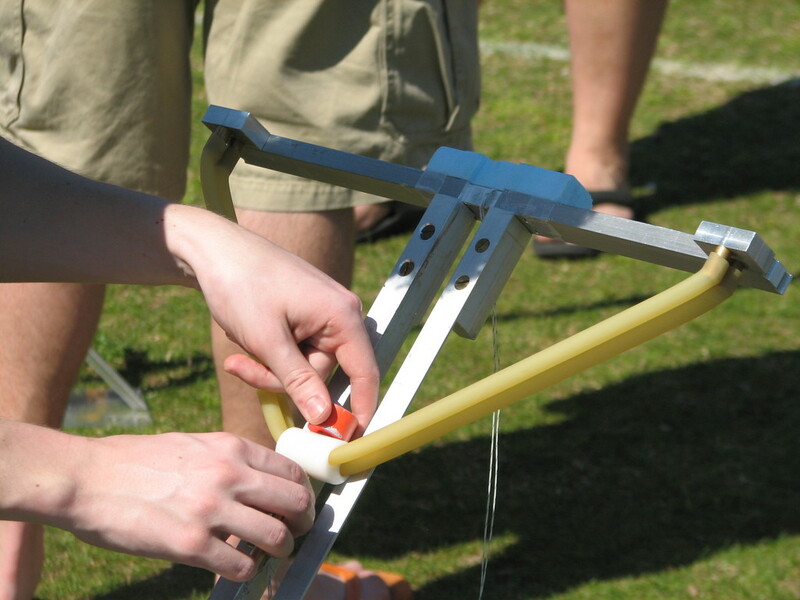 Most were catapults of some sort, using rubber tubing as a large rubber band to store energy for the launch. They were basically large slingshots. 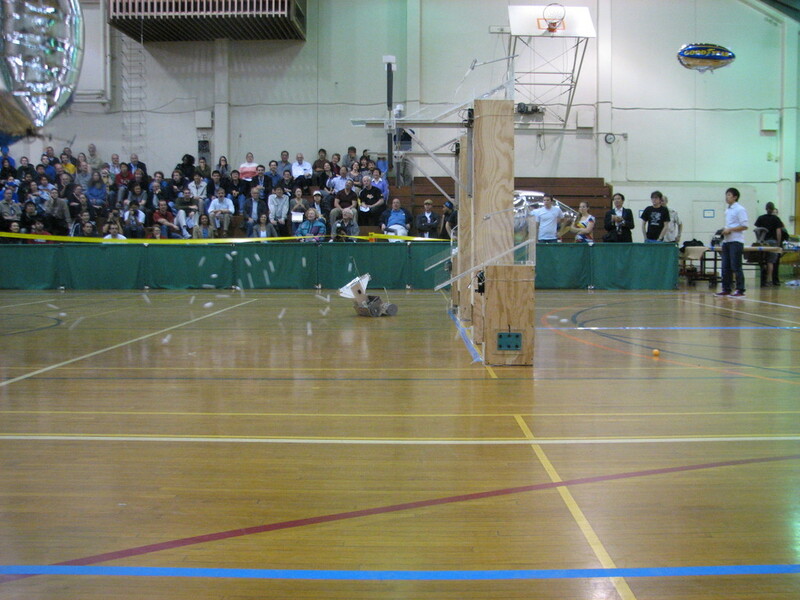 Most of these machines used a small electric motor to stretch the rubber bands. 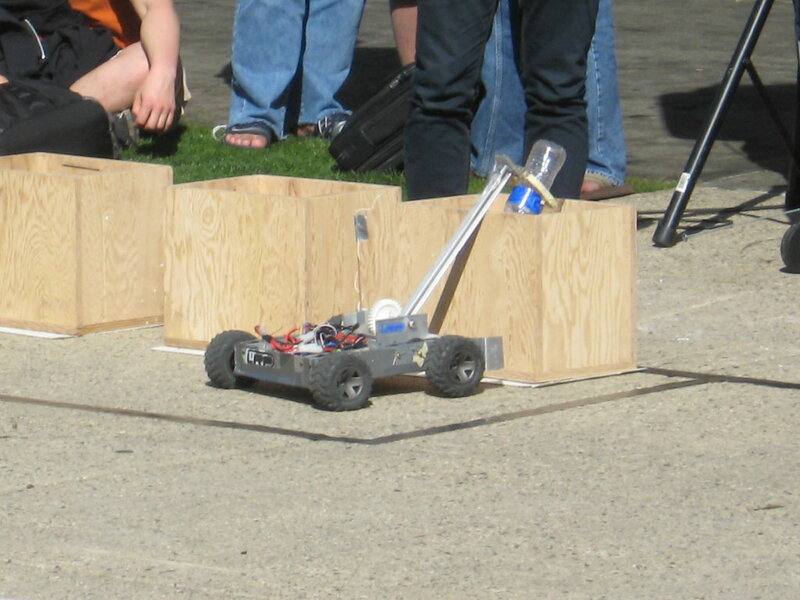 Some had very short launching tracks to fit within the space constraints. 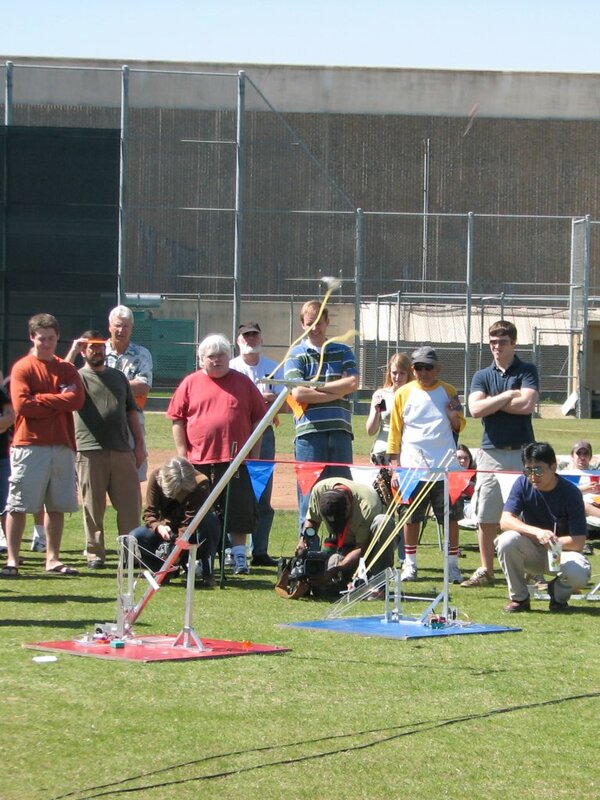 Some had longer tracks that started out vertical and had to pivot downward to the proper launching angle. 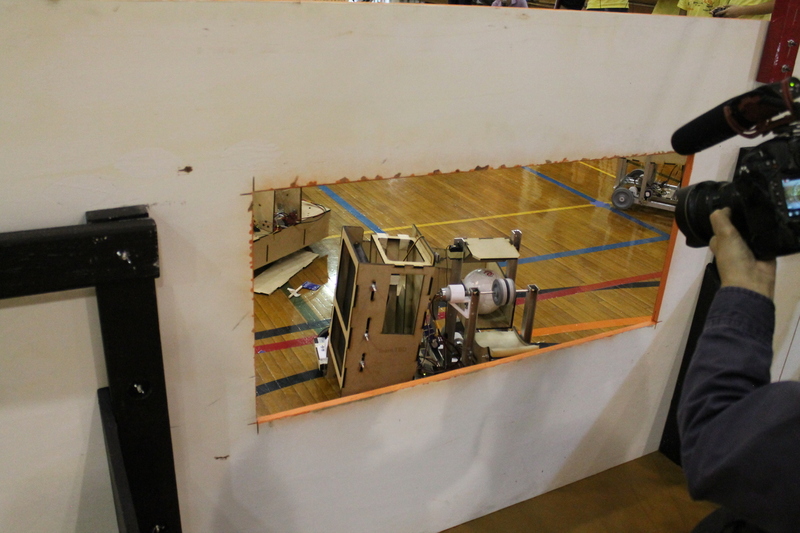 The machines had to fit within the horizontal area of the launch pads. 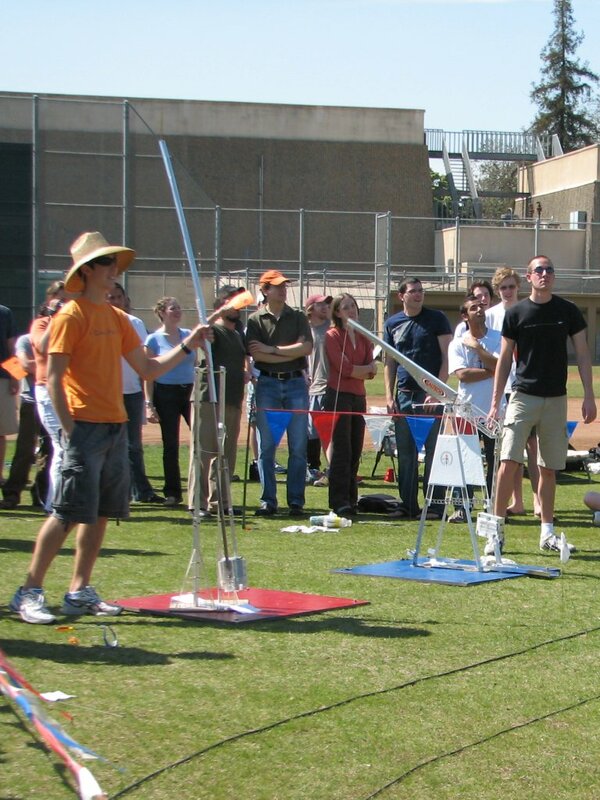 The second type of machine was a variation on a trebuchet. There were two of them in the contest, and they did very well. 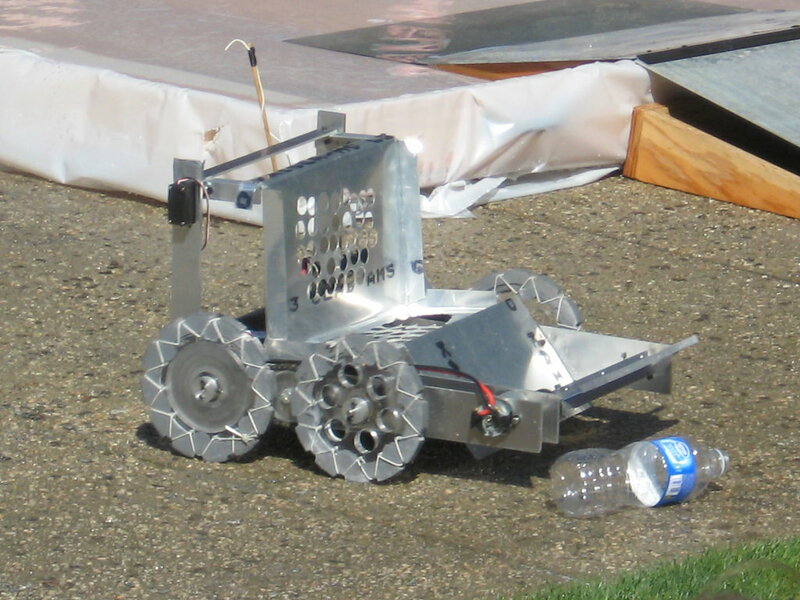 One of them was finally eliminated in a later round when its throwing arm buckled during a launch. They repaired it, but it just wasn’t the same, and it ended up losing. In the end, it came down to Team Savage Rabbit against T.T.B. (Team To Beat). 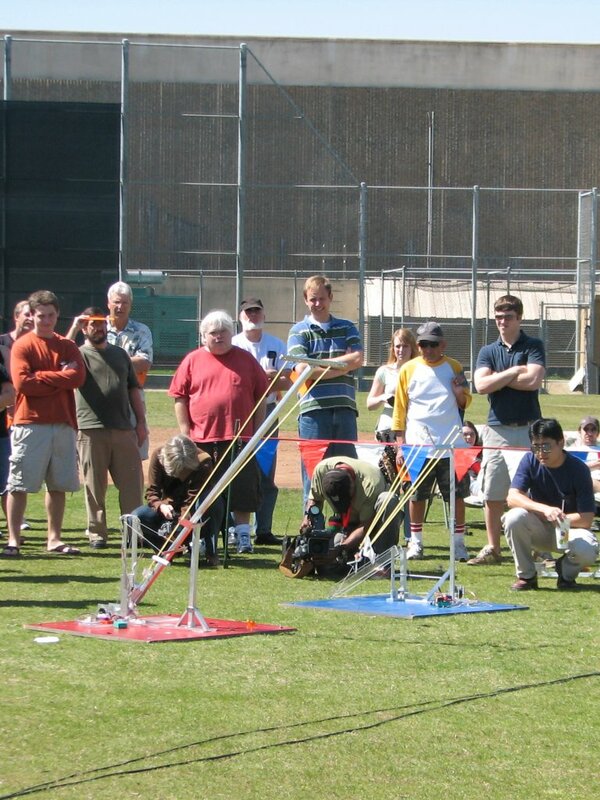 A catapult against a trebuchet. 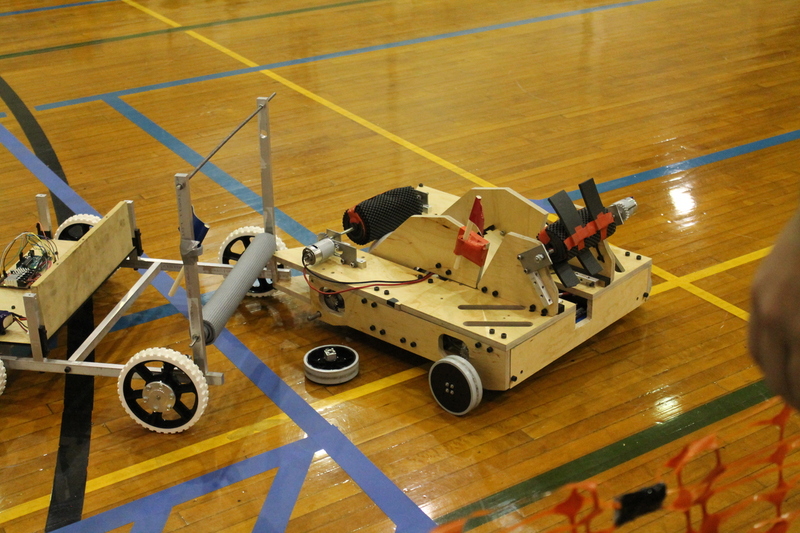 Both machines were very dependable, but in the final contest, the catapult shot its projectile just a little bit farther. The winning margin was only a few feet. Anyway, it was a fun afternoon. 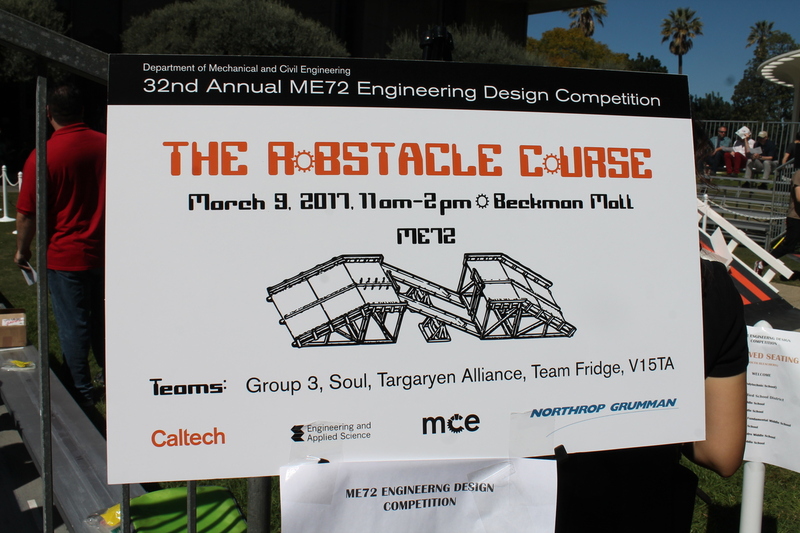 Today when I was reading my mail, I saw the Caltech calendar for the week, and it said that today was the ME72 engineering contest. 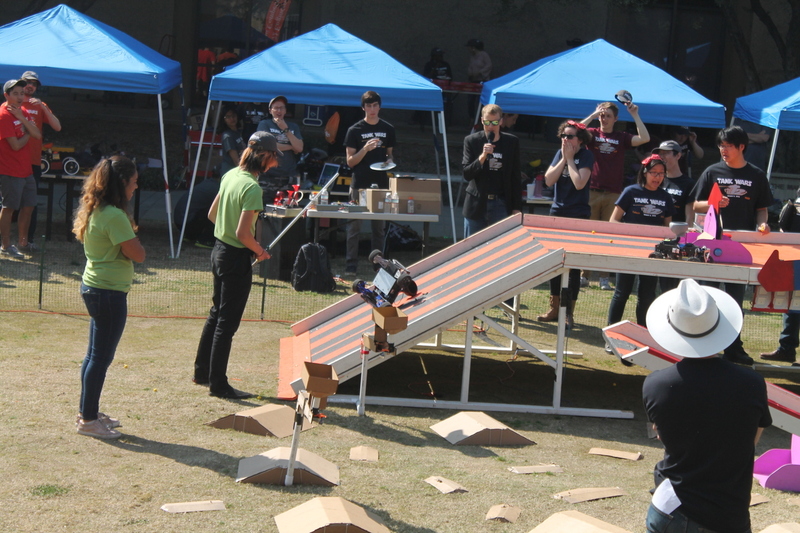 This is the course where students are issued a ‘box of junk’ and have to use it to build a machine to compete in a contest. It’s sort of a ‘final exam’, but even though there’s a winner and a bunch of losers, it’s really more about the experience. This is the first time in many years that I’ve made it out to watch. Sadly, most years I only find out about it after it’s over. So it was a treat to get to go see the contest again. Today’s contest was to take a short length of chain and carry it somehow up a plastic mesh slope. 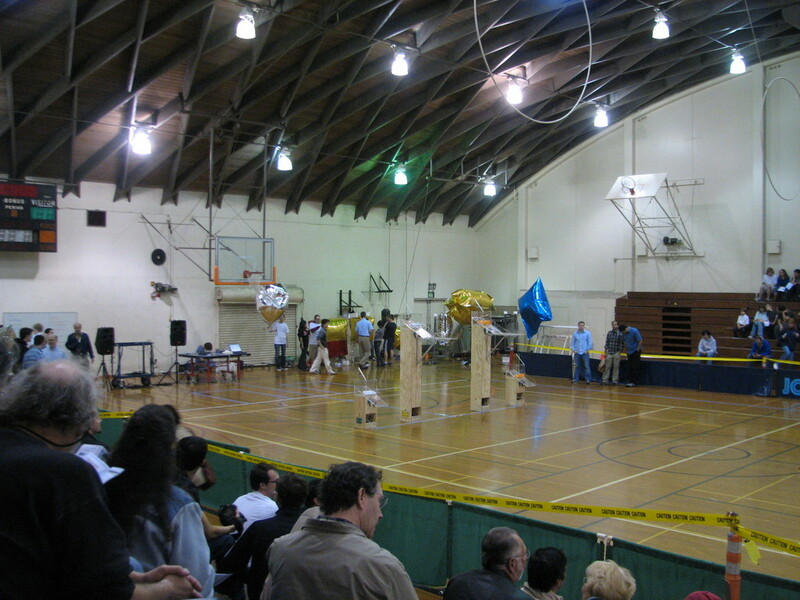 The machines competed two at a time, and many of them included features to actively interfere with the other machine. So this made for great entertainment. Many of the machines had wheels with little sprockets on them to engage the mesh and let them climb the mesh. But the mesh was pivoted at the top, like a carnival ladder climb. 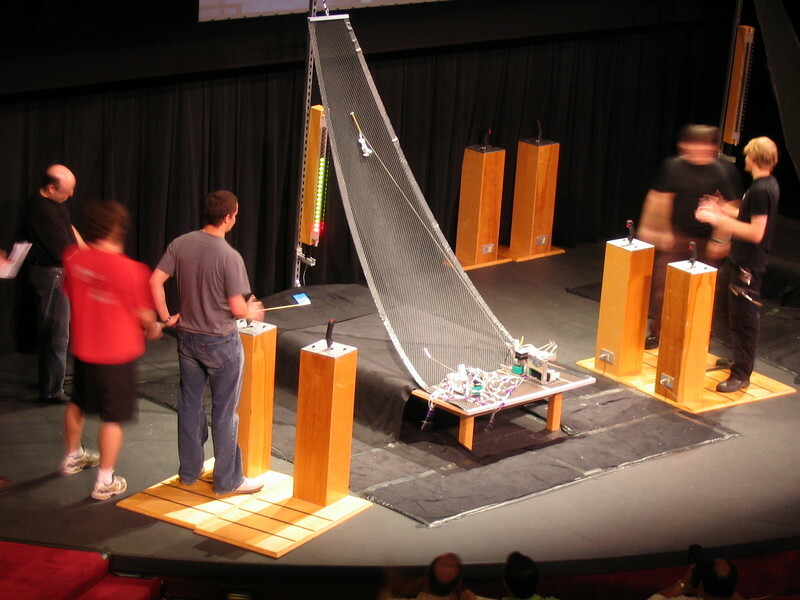 So a machine that climbed high on the mesh could fall off, and several did. Another strategy was a small grappling hook. One machine had a hook that it fired up the mesh and then used a string to hoist the chain up to the hook. 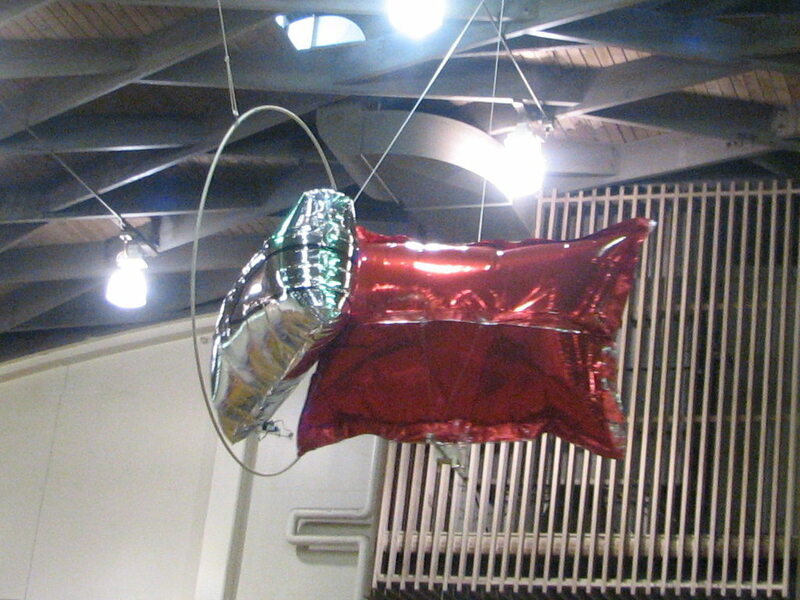 At the same time, it had a net that it launched sideways to cover its opponent. Unfortunately, launching the hook proved problematic. When it worked, it worked very well. But if it missed, then it was all over for that machine. In the end, they made it to the semi-finals, but the hook misfired, so they didn’t make the finals. The final round was between two climbing machines. 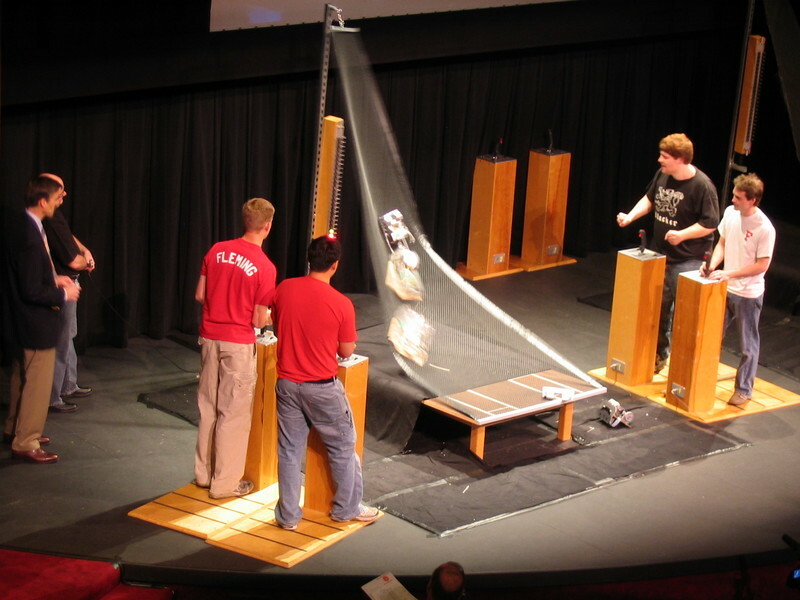 Both were two-part devices, with one piece to climb with the chain, and a second piece that could move around and try to interfere with the opponent’s machine. So this made for an exciting final round. The two climbers went up the mesh, but the smaller one got the jump and was higher. 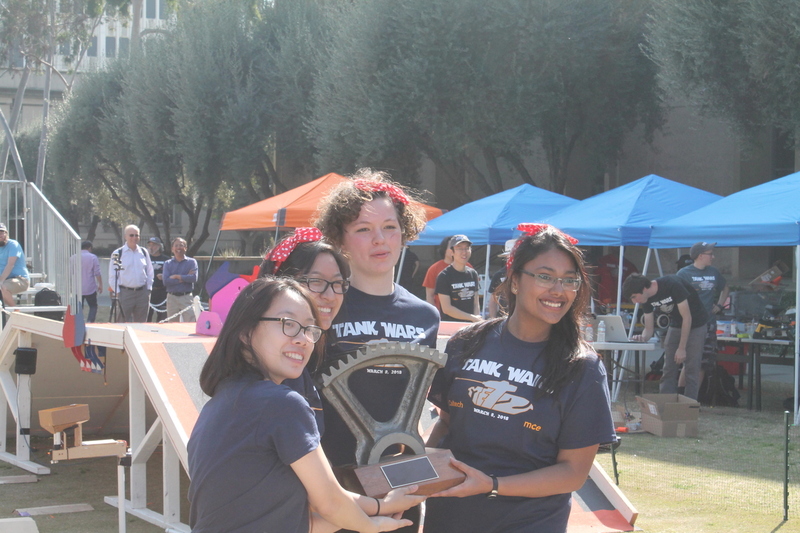 For a time it looked like it might fall off, but the hooks on the wheels managed to hold on to the end, and the designers got the trophy. This was great nerd fun.